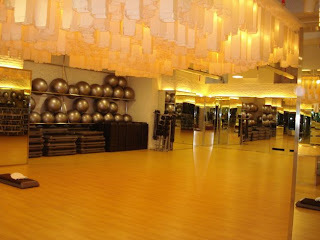 This is the aerobic studio. Slightly smaller than in Pondok Indah Mall. Has very nice view if you join the evening classes and makes the lighting much better. This picture taken in the evening. During the day, the temperature in the studio is quite hot. Some of the machines in the free weight area. This new gym has more selection of machines and quite spacious. 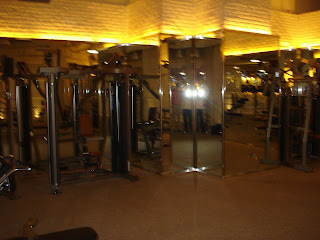 Cardio area is divided into 3 sections. This is one of the sections. 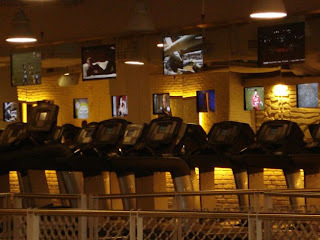 All treadmills is equipped with TV cable. No more boredom running or walking on the treadmill. Ahhh....this is me on the treadwall. 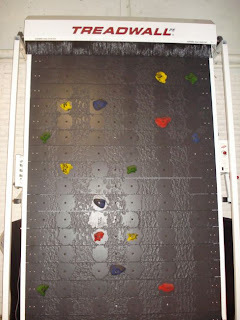 The bottom is the treadwall. Very fascinating machine to burn calories, core exercise,strenghtened your harmstring and quadricep. It's only available in FX. is it only for vip card member only?? No, all club member can enter. gue all club member tapi katanya cuma vip member aja yang bisa ke sini. yang mana yang bener nich? apakah gue mesti up grade dulu jadi vip member?